I haven’t read a good book about slavery in a long time. And, this is an excellent one. One of the things that makes it stand out is that it is not just about slavery; it’s about what humans do to each other, the motivation behind why we do it, and how it ripples (more like surges) out over the generations. In fact, what I love most about this book is the multi-generational look we get at one set of sisters whose lives have taken completely different paths. Homegoing tells the story of two women who share the same mother but never meet. One is captured and sent away on a slave ship, while the other is married off to one of the white soldiers stationed on the Gold Coast of Africa in the 18th century. What follows is an account of many generations descended from these women right up until the present. I was completely absorbed in every character’s story; enthralled by the changing times and variety of circumstances. Each character had their own chapter, and each one had me wondering what was in store for them; anxious to get to the next story while feeling reluctant to leave the one I was reading. How Gyasi was able to weave the history of the last 250 years into her 300 page book is beyond me. But, she did it. Some reviewers on Goodreads have commented on the fact that there is less connection to the characters as time goes on. I like to think that that makes sense in the context of the novel. These two lines of the family tree are getting further apart as time goes on, and becoming less and less connected with each other, and with their roots. Not only did the slave trade change the course of the lives of the enslaved, but it also had a huge impact on the people living in Africa; dividing them, filling them with shame and anger. Maybe the disconnection with the characters on the page symbolizes their ever-growing disconnection with each other and the roots of their past. Enough of me trying to sound like I know what I’m talking about (but sometimes the comments people post on GR get me thinking more about what I’ve read). What I really want to do is tell you about all the people and events in this book (I made enough notes to), but I think it would be better for everyone to read it for themselves. I highly recommend it. The need to call this thing “good” and this thing “bad”, this thing “white” and this thing “black”, was an impulse that Effia did not understand. In her village, everything was everything. Everything bore the weight of everything else. This is how they lived there, in the bush: Eat or be eaten. Capture or be captured. Marry for protection… He would not be weak. He was in the business of slavery, and sacrifices had to be made. There’s more at stake here than just slavery, my brother. It’s a question of who will own the land, the people, the power. You cannot stick a knife in a goat and then say, Now I will remove my knife slowly, so let things be easy and clean, let there be no mess. There will always be blood. … if we go to the white man for school, we will just learn the way the white man wants us to learn. We will come back and build the country the white man wants us to build. One that continues to serve them. We will never be free. We believe the one who has the power. He is the one who gets to write the story. So, when you study history, you must always ask yourself, Whose story am I missing? Whose voice was suppressed so that this voice could come forth? Once you have figured that out, you must find that story too. From there, you begin to get a clearer, yet still imperfect, picture. Weakness is treating someone as thought they belong to you. Strength is knowing that everyone belongs to themselves. … sometimes staying free required unimaginable sacrifice. War may be over but it ain’t ended. For Sonny, the problem with America wasn’t segregation but the fact that you could not, in fact, segregate. Sonny had been trying to get away from white people for as long as he could remember, but, big as this country was, there was no where to go… The practice of segregation meant that he had to feel his separateness as inequality, and that was what he could not take. We can’t go back to something we ain’t never been to in the first place. it ain’t ours anymore. This is. … what he wanted to capture with his project was the feeling of time, of having been a part of something that stretched so far back, was so impossibly large, that it was easy to forget that she, and he, and everyone else, existed in it – not apart from it, but inside of it. 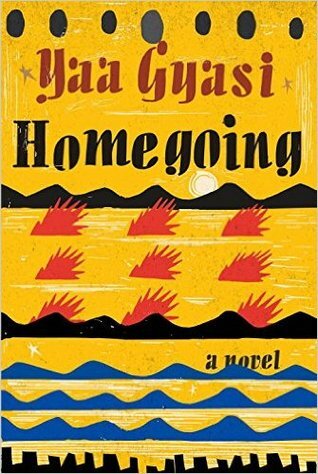 This is Yaa Gyasi’s first novel. You can be sure I’ll be watching for what she writes next! This is usually where I would link to a few reviews of the book, but there are so many – just google it! If you have written one on your blog, feel free to leave a link to it in the comments. Reading this book reminded me of Laura’s excellent review of The Wake/article about colonialism and books, at the The Rusty Toque. Read it, if you haven’t already! *Thank you to Random House Canada for sending me a copy of this book for review. I’m glad to hear that you also liked it! This one’s already on my list but you’ve further whetted my appetite with those quotes, Naomi. I like the idea of exploring the effect of slavery on the African descendants. I don’t think I’ve heard of that being done before. I was thinking the same thing – I don’t know if I’ve come across any books yet that write about the slave trade from Africa’s point of view, until now. I imagine that there are some out there that I just don’t know about. I’ll use your comment as an opportunity to ask if anyone has any to recommend?? Loved it. I hope you do , too!! Maybe if you go in thinking of it as linked stories, you might find it works better. I had no problem with it, but I can see why some people might. I was always excited to find out about the next person! I just suggested to FictionFan that it might be a good idea to go into it thinking of it as linked stories, so you’re not expecting to get settled in with the same characters the whole way through. You might find yourself in the mood for it at some point! Finally just remembered to put this on library hold! Interesting that it’s really so short for so much. It’s hard to believe she packed it all in there, but it’s great for people who don’t want a sprawling saga! Great review Naomi, you’ve made me want to get hold of a copy of this, pronto. It sounds like a must read! I have GOT to buy this, I’m hearing great things from many sources. I seldom buy new hardcovers but this one sounds like it’s worth it. Glad to hear it has your stamp of approval. Sometimes we just have to give in and buy stuff – and this one is a perfect example of that! What a fascinating premise, sounds like a great read Naomi. Too good to miss just because it’s hot out! 🙂 I hope you like it! It sounds spectacular. Will have to try it out sometime. I hope you get a chance to read it sometime! Wonderful review Naomi! I am reading this now – I have been seeing way too many excellent reviews highly recommending it and so I moved it to the top of the pile. I don’t usually read such sprawling epics but so far I am simply loving it (33% of the way through). Yay! Glad you’re loving it! It’s definitely a good one if you want a sprawling story without having to read hundreds of pages. Oh man, that line about segregation is aces. My hold on this book just arrived today, and since I have a bit of a long drive in my agenda today, so it’ll be the perfect time to start reading it! SO many good lines/paragraphs in this book. I wanted to quote the whole thing. I am also very impressed that such a grand and expansive novel was compressed into a 300-page book. That’s the perfect length for me. Was the last good book you read about slavery The Book of Negroes? That one surely was special and this one sounds very promising as well. I should find the time to read it in July! I hope you get to read this one, too! I had to wait to read your review until I could cobble together my own thoughts. You did a way better job. This book just kind of gobsmacked me – it’s so perfect, it says so much but it doesn’t overwhelm the reader. 300 pages and she managed to do all that. This is one of those books that I want everyone to read. I think it’s incredibly accessible too which, again, blows my mind because often this kind of subject matter has a bit of a niche audience. Yay, so glad you loved it! I agree – it’s a good book for everyone to read. And amazing that she fit it all into 300 pages. Lots of people seem to be reading this book right now. I notice that I again stopped receiving email notices about almost everyone’s blogs, and so I have fallen down on my reading. I’ve been preoccupied lately, but I hope to be better about remembering to check people’s blogs! I wonder what’s wrong with your e-mail notice system. It’s not just mine then? No, lately it seems to be several, including Carolyn’s. After I retire, I’lll use my home address and that will probably take care of it. One more reviewer I trust raving about this book! I started it, but when I spent more time flipping back to the genealogical chart to keep the characters straight I put it down. NOT a DNF, because I enjoyed the writing, but I could not stick with the stories. I think I need to come back to it when I’m in a different head space. I was doing that at first, too. It was much smoother for me once I decided not to keep checking it and found that there was really no need. I just tried to appreciate each character as they came. Hopefully, you will find the chance to eventually enjoy it! Thanks for your kind words, Laura! I feel the same way about including quotes – it’s often the best way to ‘describe’ the style/feeling of the book. Thanks for visiting – I’ll pop over and have a look at your review!